A new analysis of The Episcopal Church, formerly ECUSA, is a large dark cloud on their horizon. This study should be a dire warning for any denomination which hopes to maintain their place in America. The original article delves into some of the causes for this forecast, and it is not a comforting picture. All in all, it would seem to be an excellent example of a Church being co-opted by the society in with it lives, rather than transforming the society in which it witnesses. It serves as a deadly warning for all who choose societal values over those of the Faith given and received. Entire artlcle may be read at the web address at the end of the article. Photo sbows Fr. 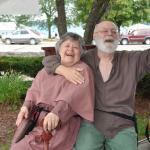 and Mrs. Orthohippo at the August 13-14, Enter Stage Right’s 2011 Will on the Water Shakespeare festival, St. Clair, MI. They sang a circa 1590AD love song duet. 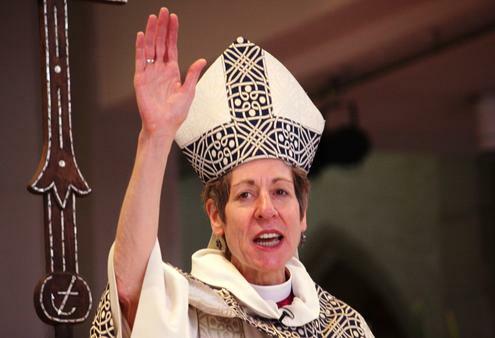 A new study of the state of the 2.3 million Episcopal Church in America has found that a third of the 6,825 parishes in the U.S. have an average Sunday attendance of 40 or less and one of the main reasons cited for the decline is the consecration of an openly homosexual bishop in 2003. Virtueonline (VOL) is reporting that their study of the state of the Episcopal Church in the U.S. reveals a church in steep decline. In addition to low attendance at a third of all parishes, more than 2,000 consist of congregations of aging parishioners in their mid-60′s where little or no chance of a turnaround is seen for the foreseeable future. The church is experiencing a dearth of young people and those being trained in the church’s liberal seminaries will “have no message that is discernibly different from the prevailing culture,” VOL reports. As a result, hundreds of clergy will be forced into early retirement or to take up a second job just to keep their doors open for the few parishioners they have left. As VOL states: “The consecration of the openly homosexual Bishop of New Hampshire, V. Gene Robinson, has proven to be the single greatest cause of conflict in The Episcopal Church. This entry was posted in Anglican, christian demographics, cultural blinders, episcopal, episcopal-anglican, Uncategorized and tagged Anglican, church membership, cultural blinders, episcopal, politics, Uncategorized. Bookmark the permalink.